this is a small experimental VST plugin i made (windows only). 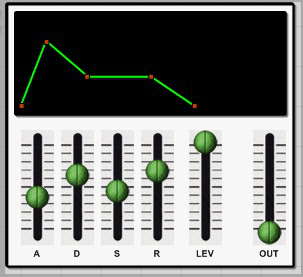 it´s pretty simple: a ADSR envelope generator that will output the envelope value as MIDI CC message. it can be triggered via NOTE ON messages and the output CC nr. is set to CC nr.1 (so by default this will be mapped to the synplant "mod wheel" parameter). note messages on the plugin input will be also sent to through the plugin., to use it, just place the plugin before your synplant device and connect the MIDI out of the plugin to the midi in of synplant. the OUT slider on the right side of the plugin gui will give you a preview of the generated envelope value. rough and quick preview of the plugin. excuse the bad audio/video quality , it was late at night :lol: i will replace this video with a optimised version asap.